The Match encourages physician passivity, which hurts health care. Does the annual practice of matching doctors with residency programs encourage a problematic level of passivity? 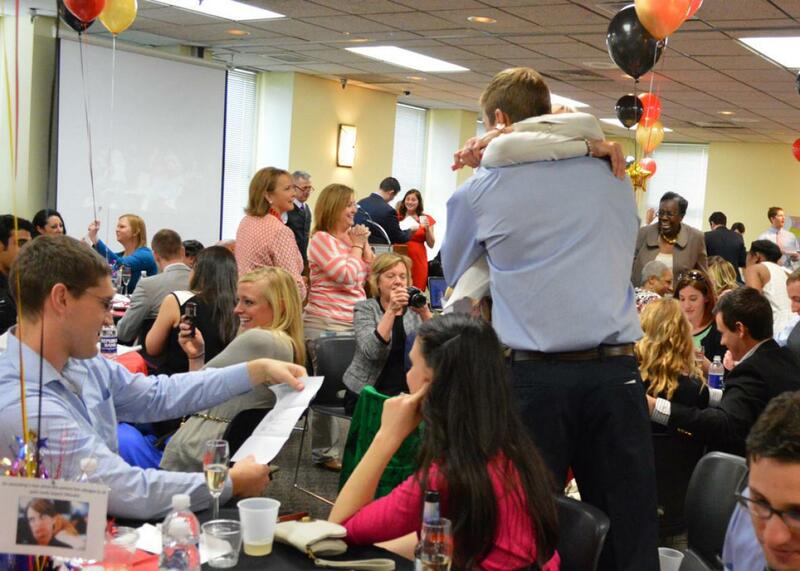 A couple embraces as letters of residency are opened at noon on March 21, 2014, at a Greater Louisville Medical Society Match Day event. Friday marks another iteration of the National Resident Matching Program—“the Match”—perhaps the best-known bottleneck for aspiring U.S. physicians. Every year, this complex computerized algorithm assigns senior medical students to the next phase of their clinical training. Upon selecting a medical specialty, applicants make a list, ordered by preference, of whichever residency programs grant them an interview. After a few months of waiting, an inscrutable bit of software tells them where to go. Binding contracts must be signed well in advance to honor these results, whatever they may be. At most American medical schools, Match Day involves the ceremonial distribution of envelopes to be opened at a designated time, sometimes onstage, in front of one’s assembled family and friends. Within minutes, a full range of emotions is usually on display—elation or ambivalence, surprise or heartbreak. As a rite of passage, the whole thing requires a certain resignation to fate, the strain of which is often more visible after that fate is sealed. The Match originated more than 60 years ago, supplanting a more traditional, decentralized market in which job offers were extended one by one, often along progressively unreasonable timelines. The original algorithm has since undergone multiple revisions, most recently in 1998 by the economist (and later Nobel laureate) Alvin E. Roth. The system maximizes efficiency as a proxy for contentedness; last year, 94 percent of participating U.S. medical students secured a residency position, and 96 percent of available training positions were filled. I have gone through the Match twice now, first for residency and later for fellowship, and for all its aggregate expediency, I recall the individual experience as a stressful one. Both times, I felt the usually taut thread of my life slacken and begin to fray. During my interviews I was buoyed by the false sense that my life was somehow underwritten by several backup trajectories; after submitting each rank list, I settled into a prolonged funk, simultaneously questioning my preferences and wondering if they’d be honored. Not knowing if I’d be moving north or south, inland or to the coast, I settled into a dreamy headspace in which all possible outcomes seemed partially true. Match participants reckon with this peculiar fraction of agency—too little to guarantee a happy ending, too much to feel martyred by a sad one. Of course, it’s difficult to feel sorry for budding physicians, conditioned by privilege for such neurosis. The graduating medical student—highly educated and gainfully employed—remains squarely among the ranks of the blessed, even if her new place in the world is hundreds of miles from where she thought it’d be. These bright prospects contrast obviously with those of many of the patients she’ll look after—individuals also carried, bewildered, by forces larger than themselves. Still, the experience of seeking a job under these constraints seems capable of leaving marks on the psyches of future physicians and, by extension, on the culture of the profession as a whole. In this light, the Match becomes less a hurdle to clear before getting down to the business of doctoring and more an introduction to the experience of dislocated control that can span an entire career. For many students, Match preparation turns out to be a highly dissociative exercise. Significant time and energy are required to construct 10 or so hypothetical versions of one’s future and then to embody them in parallel, not knowing which will come to pass. At the outset of a career in medicine, therefore, autonomy is systematically undermined. This point, I think, is subtle but significant: Rather than work being something you make happen, work becomes something that happens to you. What are the implications of this challenge to autonomy? Perhaps none of any lasting consequence. But consider the language of crisis that has dominated the current conversation about American health care and the relative quiet of American physicians in the face of it. Is it relevant that trainees are obliged to begin their careers in quiet deference to a byzantine, nontransparent, and non-negotiable system? Could a passive professional stance be something that’s learned and carried forward? By now, arbitrary price-setting, dense bureaucracy, and stark inequities have all become recognizable features of our clinical landscape. There are, to be sure, steady rumbles of activism from within the physician community. Articulate dissents have emerged recently in the popular and academic press, including relatively full-throated criticism of anti-immigration policy as a detriment to innovation and patient care. A recent petition protesting Tom Price’s nomination to lead the Department of Health and Human Services garnered more than 6,400 physician signatures. For the sake of comparison, however, there are more than 900,000 professionally active physicians in the U.S. While it’s possible that the substantial remainder are conservatives, doctors on both sides of the aisle have a tendency toward political inertia. I am in my last year of fellowship at the Johns Hopkins Hospital, the place where formal residency training originated at the turn of the 20th century. Here, the internal medicine program’s motto is aequanimitas—equanimity—the ability to proceed placidly in one’s work regardless of surrounding circumstances. This quality was championed by Sir William Osler, the program’s founder, but its obvious clinical value translates poorly to the realm of policy. As a breed, for better or worse, physicians seem better equipped to adapt to external obstacles rather than to interrogate and dismantle them. When I was a medical student on the wards, stumbling from time to time over points of ambiguity, I remember being told by supervising doctors to “use common sense.” I was too deferential to challenge this advice, but privately, there wasn’t much about the work that struck me as baseline sensible. Why do so many patients return to the hospital so soon after leaving? Why do we spend so much time writing notes? Why don’t any of us know what anything really costs? There are plenty of independent thinkers in medicine who are tackling such questions head on. In general, though, medical training can be seen as almost deliberately disorienting. The crucible of clinical apprenticeship breeds a tolerance for the status quo as young physicians become accustomed to just pushing past the unpleasantness. By no means are the flaws of the Match some sort of linchpin diagnosis for what’s wrong with contemporary medicine. Indeed, from a logistical perspective, the current system may be the most efficient approach to residency placements at large. This elaborate process, however, constitutes one of many professionally mandated cognitive contortions—perform enough of these, and you become a contortionist. Thus arises the possibility, at least, that undermining students’ powers of self-determination early on might facilitate their acceptance of downstream absurdities. The Match has been subject to multiple criticisms over the years—the high burden of cost placed on the applicant, the increasingly perfunctory nature of the final year of medical school—but its possible effects on developing professional attitudes are often ignored. Making this decision on trainees’ behalf helps shape their self-conception as witnesses rather than authors of their own futures. This distinction becomes a bit sadder when extended to health care reform, a process that could benefit immensely from deeper physician engagement, were we not so accustomed to working within flawed systems rather than disputing them.